Spaceman Coffee co-owners (left to right) Kristen Black, Kaiti Blom and Brandon Nelson. "Let's get you caffeinated!" 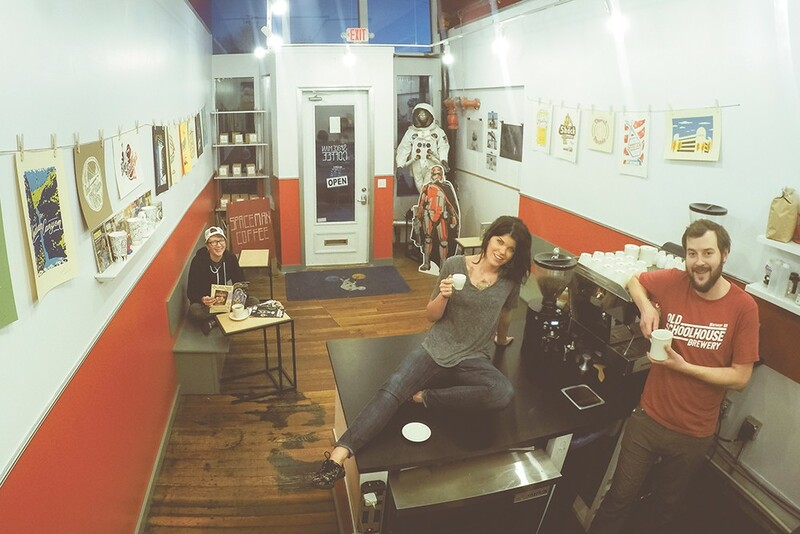 says Spaceman Coffee co-owner Kristen Black to one of her late-night customers last Saturday. The cozy living-room-size space, which, audibly, shares a wall with the Bartlett and is directly in front of the Richmond Art Collective gallery, has only been open as Spaceman Coffee for three weeks, but already foot traffic has brought customers in during all hours of the day. The shop is open until 11 pm on Friday and Saturday. People are free to drink coffee and hang out on one of the two long, wooden benches along the walls, peruse the book nook (mostly science fiction and philosophy titles), or order a beverage to go. Tonight, Black, an Inlander freelance photographer who has never worked in coffee before, is carefully making espresso drinks along with co-owners Kaiti Blom (Black's partner) and Brandon Nelson, who met as baristas at Revel 77 Coffee on the South Hill. This coffee shop was recently a Coeur Coffee location for less than a month. In late December, Coeur Coffee owner Mike Garrison came into Revel to offer the annex space to Nelson's parents and Revel owners Mike and Deb Nelson, but only Blom and Nelson were working. Later, Black, who was sitting in the shop that day, said, "So, we're going to buy that, right?" Hastily, the three put together a business plan. By January, the space was theirs. "People always asked me, 'When are you going to open your own shop?'" says Blom, who's worked as a barista for about nine years. "But it was never something on my radar. This was something we were able to do because it was already set up as a coffee shop." The group easily agreed on the shop name (although there's already a Spaceman Coffee in New Zealand), the décor (yes, that's an astronaut suit in the front window), the long hours to better serve patrons, and of course the flavors. They use beans from Vessel Coffee Roasters, a Spokane company that began operation in late 2014. "We chose Vessel because they roast for flavor profile," Blom explains. "They're really paying attention to what the coffee is telling them." The coffee pairs perfectly with the trio's handmade syrups — currently chocolate, vanilla and caramel — that never get too sweet. "We're not about sweet around here," Blom says. "We only add in enough for flavor."